"The KUHL RADIKL SHORT presents cutting edge technological advances in matching an exoskeleton woven cloth frame with flexible alternate knit fabric panels to create something revolutionary. 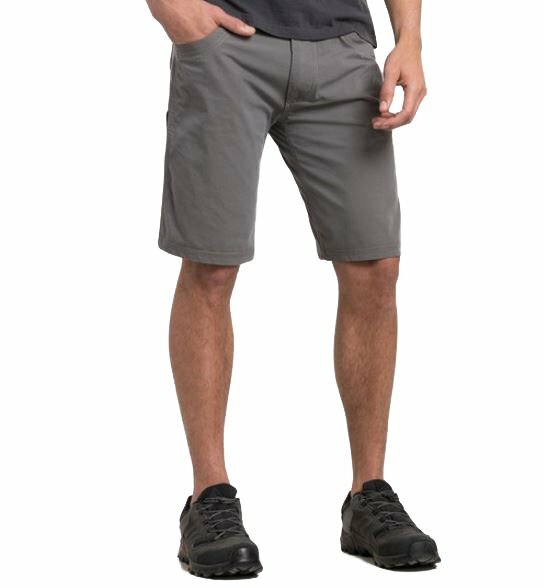 Using a frame of woven fabric to create structure gives the RADIKL the appearance, strength and performance of a traditional hiking short. It�s durable fabric and its structured form is what the world will see. What you will feel will be the relaxing soft comfortable flexibility and comfort of the knit fabric panels at key points of contact and flexion. The result is the comfort of �sweatpants� (knit fabric) with the technical performance of a woven garment. Fusing together the best of both comfort and appearance with function and performance is what sets K�HL apart and the K�HL RADIKL SHORT takes this formula to an entirely new level. Welted Stealth Cell Pocket keeps you phone and wallet secure. Placed on side. Keeps you from sitting on your wallet or phone. RADIKL SHORT presents cutting edge technological advances in matching an exoskeleton woven cloth frame with flexible alternate knit fabric panels to create something revolutionary. Using a frame of woven fabric to create structure gives the RADIKL� the appearance, strength and performance of a traditional hiking short. "